This year has been full of surprises. I started with a running vacation in Houston (who’d have thought?). I’d done a string of road marathons, hitting four sub-3:45s in a row. Considering I’d only run my first sub-3:45 at Top of Utah in 2006, this is amazing to me. For a while. I’ve wanted to shift my focus to trail events. Focus less on speed, more on the “zen” of cresting a hill and enjoying the view. And so 2012 has included more of these, and fewer road marathons. 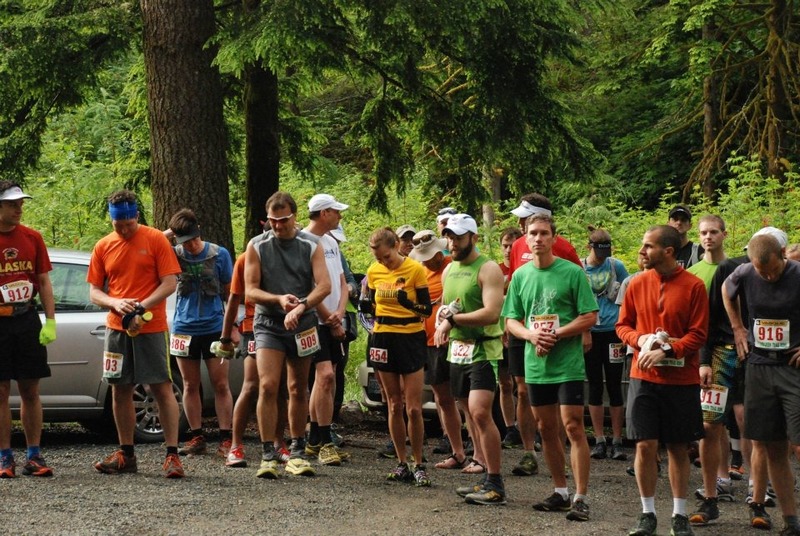 Three of the five events I’d completed so far had been trail events, two of them 50Ks. 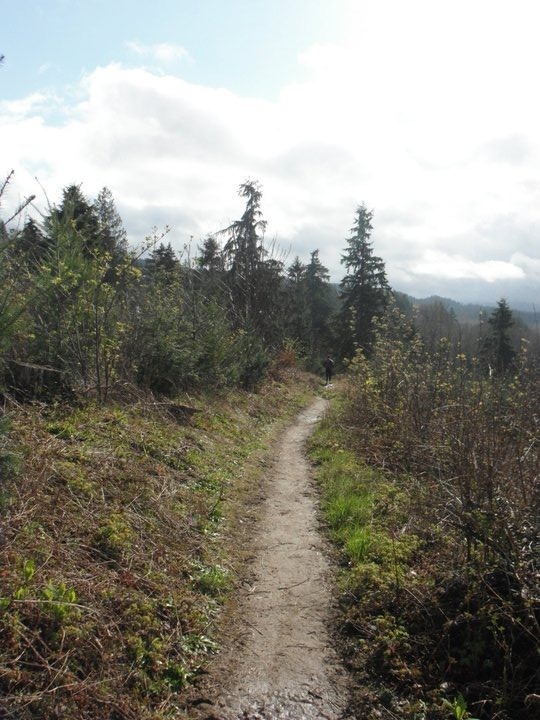 When I signed up for the Evergreen Trail Runs Taylor Mountain 50k, I felt good about spending some quality trail time. Thing is, this year’s weather in the Pacific Northwest has been –ahem- interesting. Temperatures are cooler than usual, and we’re seeing more rain than we typically do. Still – I was not anticipating what was going to happen at Taylor Mountain on the 23rd of June. Two days prior, when Roger and Yumay had been out to mark the course, it had been beautiful. You could apparently see Mount Rainier from the Holder Ridge trail. The morning of the event was misty and overcast though. Still – as the Pacific Northwest expression goes “if you don’t like the weather, just wait five minutes”. And indeed it did – several times. We headed out promptly at eight. The crowd of marathoners and 50kers was pretty thick on the single track trail, but the pace was decent. And then just shy of a mile, we came upon Holder Creek. At first glance, it didn’t look like anything too hard, but when we got our feet wet, I was in up to my knees immediately. And the guy in front of me went down even more, warning us that he’d found a deep spot. 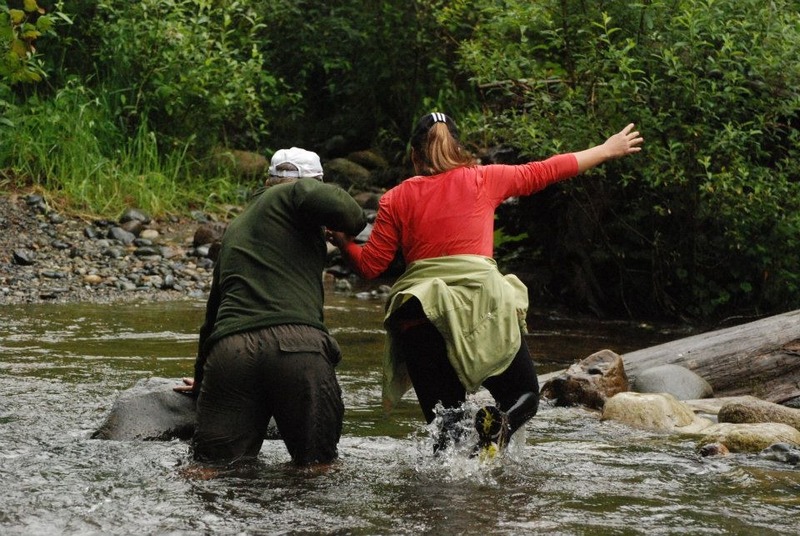 The current was strong enough that I had to take care with my footing. When I came out on the other side, I sensed that this wasn’t going to be a fast day on the trail. The creek had separated me a bit from the pack, so I proceeded up the trail. We’d begun to climb by then, not too steep but a steady uphill. As it was so early in the event, I walked it, leaning my body forward and trying to keep a good pace. I’d never run out here, so didn’t know the course. But I noticed pretty early on that there would be some good up and down. Better to take it easy. 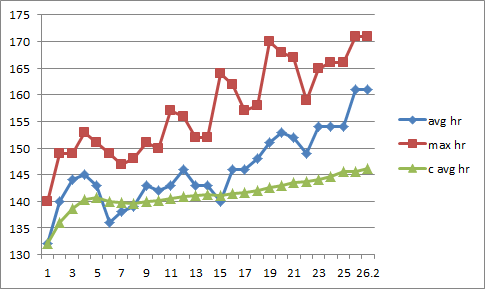 When things leveled off a bit, I caught up to some other runners. I fell into a conversation with two women running their first trail ultra. 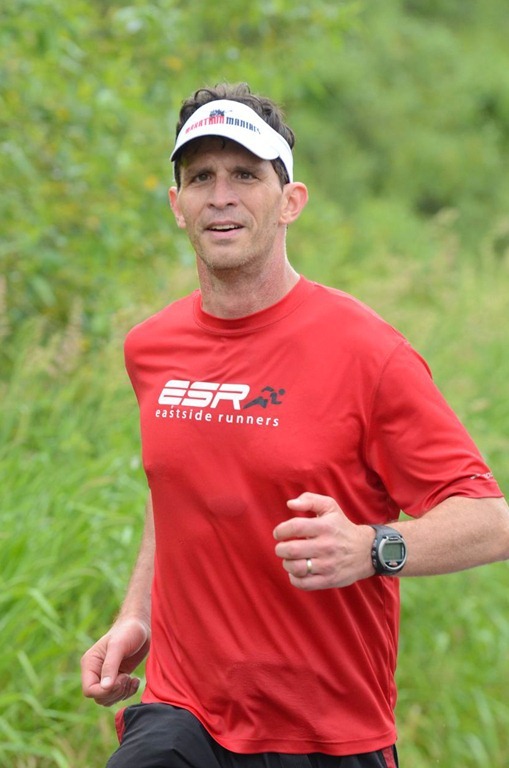 We chatted for a while about running and our kids. I knew their pace was a bit faster than I would sustain, so eventually they went on ahead. And then about six and a half miles in, something strange happened to me. We were on a steady downhill stretch, and I noticed that my heart rate monitor told me that my heart rate was about 170, easily 30 bpm than I would have expected. So I slowed down to try to gauge whether this was an instrument thing, and my heart rate promptly went down to about 115, where I would have expected. So now I had a problem. I couldn’t dismiss the reading from the monitor, but I felt just fine. I tried this several times, with the same results – each time I ran, my heart rate would shoot up. I actually considered dropping out – after all, if my heart rate was out of whack, I might be in trouble. After about ten minutes of mulling this over, I simply stopped looking at the heart rate, trusting that if my heart rate were so elevated, I would know soon enough – because some serious fatigue would set in. If that happened, I’d be done for the day. But it didn’t seem necessary to call it quits early. So I ran at an easier pace. but kept with it. About two and a half hours in, I began the descent back to the trailhead, running along Holder Ridge. As I ran the switchbacks, I passed by the youngest marathon participant, a 10 year old girl. She was doing her third marathon in three months, which qualified her to become a Marathon Maniac. She was running nice and easy, and appeared to be enjoying herself. By the time I completed the first loop, I was feeling a bit tired. 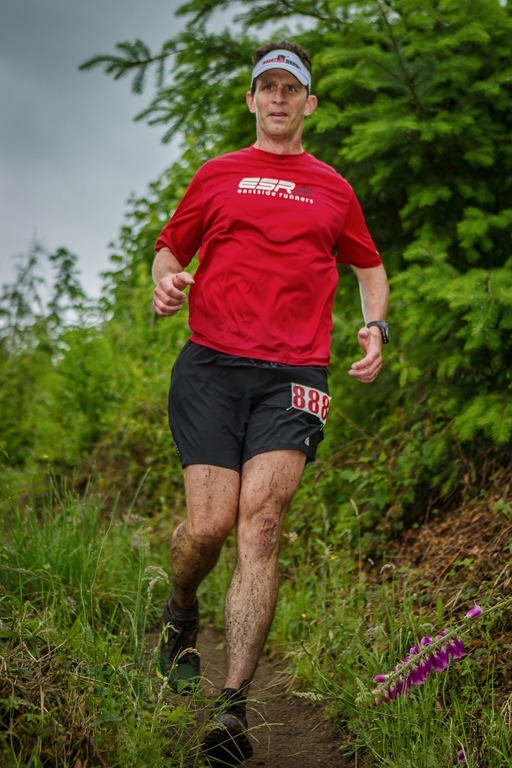 I’d ran a good 17 miler out on Tiger Mountain the weekend before, and my quads still felt it. SO I took a few minutes break before starting my second loop. At this point, I wasn’t completely certain I’d stick it out for the full 50k. I told myself I’d see how I felt after finishing the second loop, which would be the 26.2 mile mark. If I felt up to it, I’d do the full 50k. So I slogged along. By now the weather had changed several times. We’d gone from misty to partly sunny and warm, and then got some pretty epic rain – east-coast style. I just tried to quiet my mind and keep moving. I crossed the creek again, and did the climb. Along the way I started running with Rikki from University Place. We spent time swapping stories about our kids and relishing the glorious weather. Having company made the miles fly by, and soon we were heading down Holder Ridge again. We ran in to complete the marathon distance. By then I’d decided I would do the third loop to round things out at 50k. Many of the runners had come in, and they were starting to clean things up at the finish. 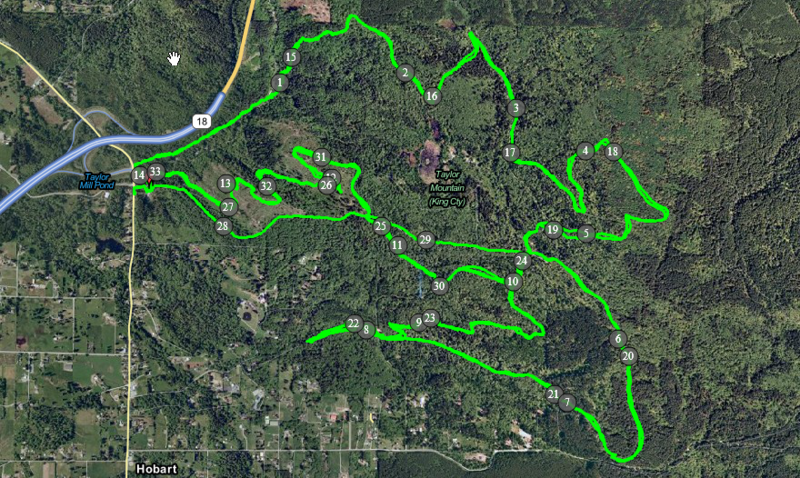 The five mile loop starts with a long steady climb up a fire road. I walked along, hoping that I wasn’t in last place. I figured I’d be a bit over an hour this last time around, and was happy when I crested the hill, and did a bit of a downhill stint. About two miles in, I came to the aid station where we merged with the half marathon course I’d already done twice. Just under 5k to go. By now I was really feeling the miles. 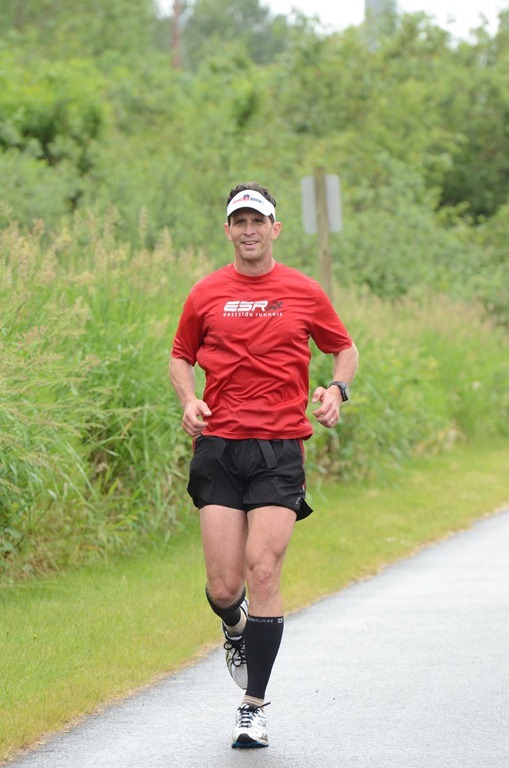 My hip flexors were raw and it was harder to start each stride, even when going downhill. I relaxed as best I could and kept moving. By the time we leveled out, I was pretty cooked. I crossed the finish in 6:52, and was very happy to be done. A couple of things stick with me about this event. First, despite posing a challenge at the time, the weather added some fun to the day. When we get deluged like that, all you can do is shrug. Second, I’m so happy I ignored the monitor. Sometimes the gadgets hurt rather than help. And third, this one marked six marathons/ultras in the first six months of 2012. Maybe I’ll try for twelve in ‘12. The chart doesn’t say much about this race. I knew I started out a bit fast, and knew that I slowed down as I went. The map would be better if I had a reliable elevation plot. As my GPS tells me I climbed over 12,000 feet (more than 2x the 4500 we actually climbed) I don’t trust it enough to post it for reference. Today was less about the numbers, and more about just running the muddy trails. green river– third time a charm? One of the many things that makes the Seattle area a great place for running is the availability of fun, low-cost events. 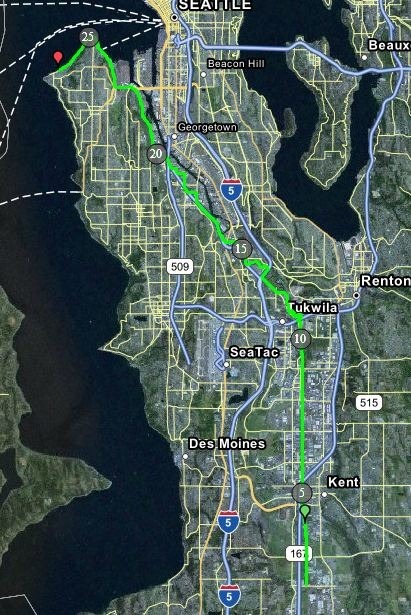 The first Saturday each June, Steve Barrick puts on the Green River Marathon – a point to point course that takes us from Kent, out to Alki Point in West Seattle. It’s (mostly) flat and fast, very well-organized, and you can’t beat the price – it’s free. So early on the morning of June 2, I met my friends Randy, Lynn, and Tony at Alki Point to grab a ride to the start. We piled into Randy’s car for the drive out to Kent. They sent us off promptly at 8:30. 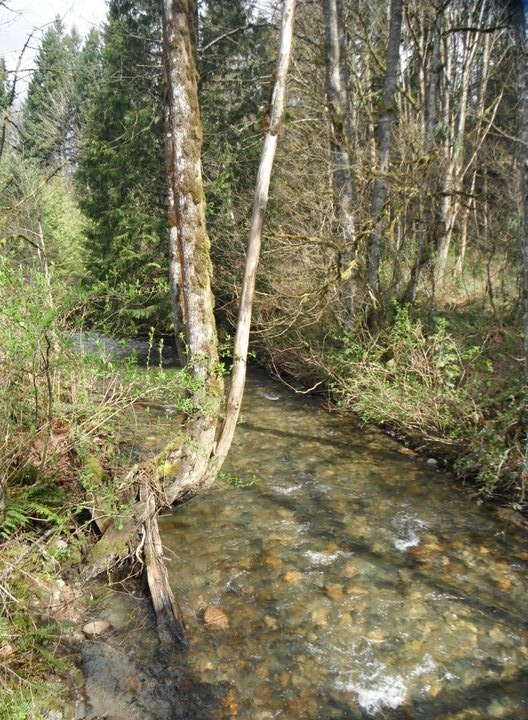 It took a few miles for my pace to settle into ‘comfortable’, along the Interurban Trail. I wanted to keep my heart rate low. I still felt tired from the previous weekend’s adventure in Soaring Eagle Park, and I knew I should run conservatively today. But through about mile 9, my splits tended to be a little bit faster than I’d typically do. After hitting each mile, I’d back off a little, and try to settle down. I paid attention to my mechanics – lower/shorten my stride, lean forward a little, and try to keep my effort level low and steady. Just past the halfway point, I was on pace for a sub-3:45. I had started to feel a bit more fatigue, but nothing out of the ordinary for logging 13 or 14 miles. Here’s where the event changed for me though. We went off the trail, and started through industrial areas towards South Seattle. As we progressed towards mile 18-19, I knew we’d need to turn to the west, and could see the West Seattle Bridge approaching. By now, I was definitely feeling the miles. My pace splits had not slowed very much, but I felt like I was working much harder. My heart rate had climbed a bit – I was regularly over 150 by now, but it wasn’t as high it I thought it should be (given how I felt). I’d always used my heart rate to gauge my fatigue levels in the late miles. This time my legs trumped my heart rate. My wheels fell off. Heading up towards the bridge, I’d reached the point where I couldn’t muster much energy to talk, just needed to lean forward and keep moving. By now I felt some leg cramping coming on, so it felt important not to stop and let myself tighten up at all. And this is how things were as I turned up Harbor, heading toward the Alki Trail. When I got there, I knew it was simply a matter of looking out along the water, and digging deep. I’d thought I might be able to muster some fast splits along the water – it’s a very nice stretch, and it’s flat. Not so much left in my legs though. 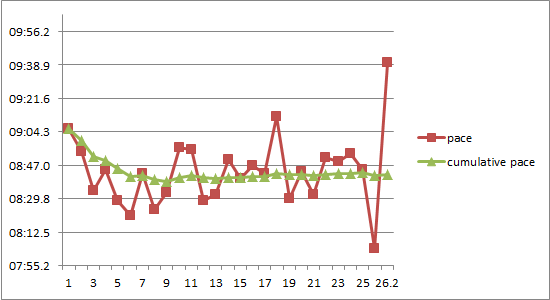 Mile 22 through 25 were steady, around an 8:50 pace, definitely slower than the earlier miles. When I hit mile 25, I was able to muster another gear. 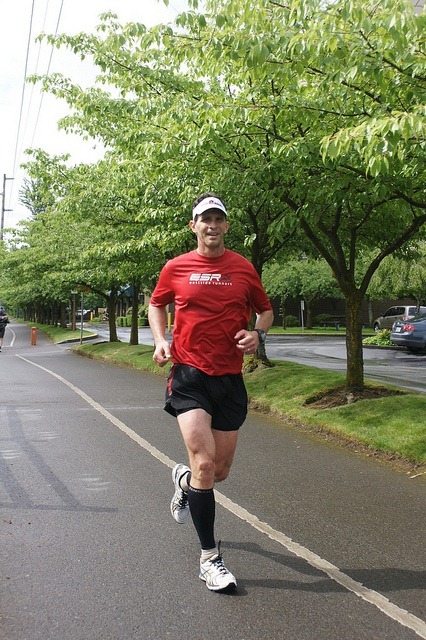 This was my fastest mile – about an 8:04. Unfortunately it was followed by a pretty slow 0.2 to the finish. 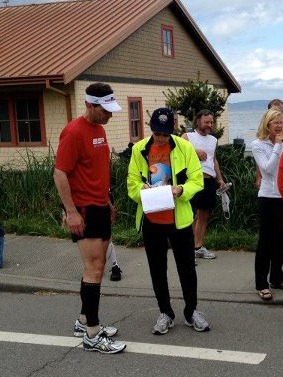 As I crossed, Race Director Steve Barrack called out my time – 3:48:11. Respectable – although not the best race I’ve ever run, measured by the clock or by the overall quality of the effort. I walked for a few minutes, up to the Statue of Liberty and back. Then I made the mistake of laying down in the grass by the beach near my friends from the relay team “Run Amok”. It was very difficult to get back up, but I felt a bit better after a mound of deep fried fish, oysters, and fries. Note to self – don’t overdo it with the deep fried stuff even after running 26.2 – the fatty stuff just isn’t that satisfying. My next weekend is not likely to include an event – time to attend to the essential parts of life. But clicking these three off has been a lot of fun. 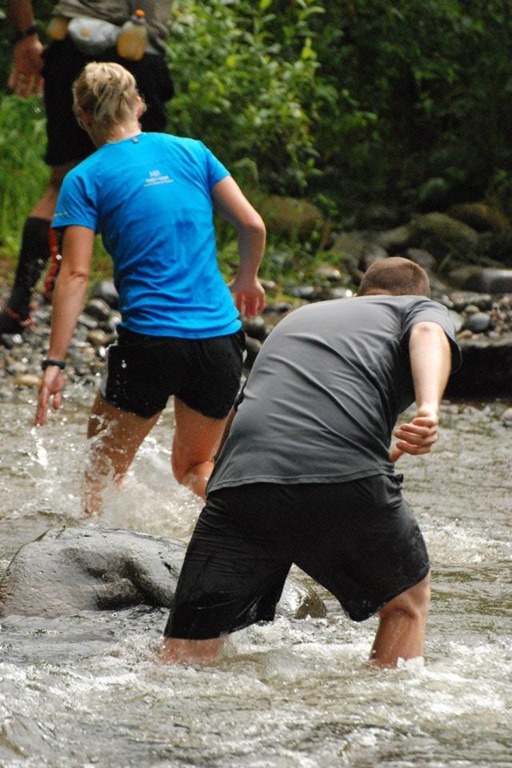 And doing Green River again was a nice way to cap it – even if I’ve had better days running. The plots tell a good bit of the story, although I’m a bit surprised that there isn’t more of an upslope in my pace times in the late miles. 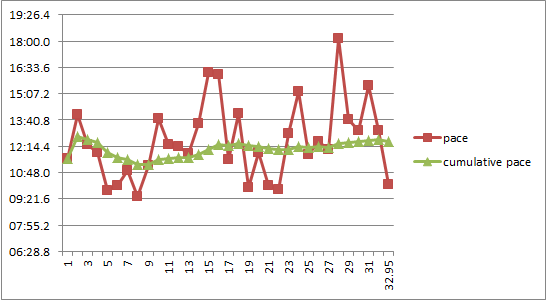 The heart rate plots do show the fatigue curve, even though I was not seeing it as I ran.